Founded in 1993, the Electronic Healthcare Network Accreditation Commission (EHNAC) is an independent, federally recognized, standards development organization and tax-exempt, 501(c)(6) non-profit accrediting body designed to improve transactional quality, operational efficiency and data security in healthcare. The Electronic Healthcare Network Accreditation Commission (EHNAC) grew out of the 1993 Workgroup for Electronic Data Interchange (WEDI), sponsored by the Network Architecture and Accreditation Technical Advisory Group. The healthcare transactions industry agreed there was a need for a self-governing body to develop standards for the industry, and the Association for Electronic Health Care Transactions (AFEHCT) championed the cause by sponsoring an Accreditation Workgroup. More than thirty representatives from all facets of the healthcare transactions industry participated in a series of meetings and surveys to develop the first industry standards for data transmission, data security, advertising and resource capability. Funded by a loan from AFEHCT, the independent, self-governing EHNAC was born and began accrediting electronic health networks in 1995. Learn more about EHNAC’s leadership. An independent, self-governing body, EHNAC represents a diverse cross-section of healthcare stakeholders. Electronic health networks, payers, hospitals, physicians, consumer groups, financial services firms, state regulators, security organizations and vendors are all working together to establish sound criteria for third party review and accreditation. Through this industry collaboration, EHNAC is realizing a shared vision and providing a valuable service through accreditation programs that promote standards, best practices, administrative simplification, open competition and protection of information exchange regarding security, privacy and confidentiality in the marketplace. Each EHNAC-recognized organization improves business processes, encourages innovation, improves quality of service, ensures regulatory compliance with HIPAA, HITECH, ARRA and the Affordable Healthcare Act, and expands market opportunities. Promote accreditation in the healthcare industry to achieve quality and trust in healthcare information exchange through adoption and implementation of standards. EHNAC is the premier accreditation authority promoting standards that support interoperability, stakeholder trust, regulatory compliance, quality service, innovation, and open competition within the healthcare industry. 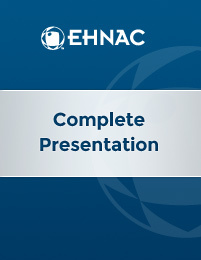 EHNAC has developed a downloadable corporate brochure and comprehensive slide presentation, that provide further details concerning EHNAC’s background and accreditation programs.